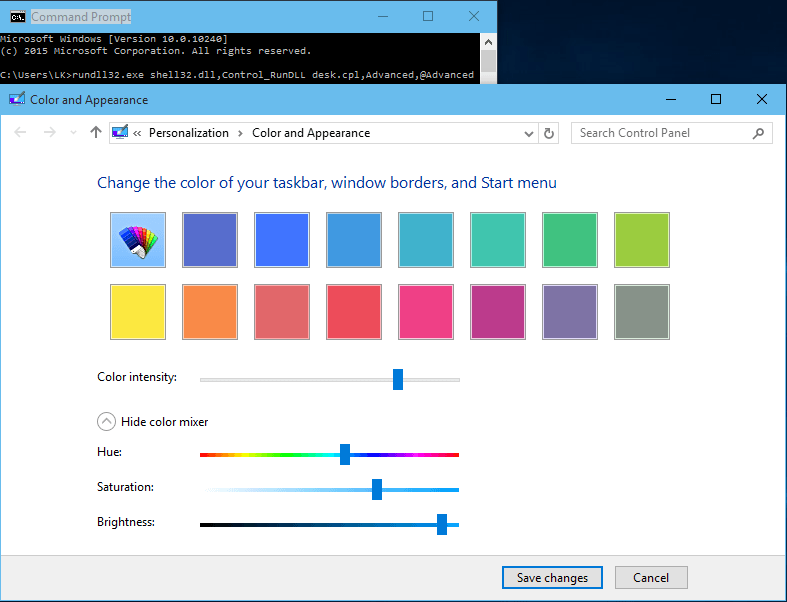 In Windows 8 and Windows 8.1, when much of the Personalization options are available through Control Panel, you can use a color mixer to fine tune and pick any color you like when changing the color of window borders and Taskbar. In Windows 10, much of the Personalization options have been moved to the Settings app, and the color mixer is no longer available on the GUI. As the result, you’re limited in choice of color to several standard and common colors that are available for selection. However, the Desktop-based Control Panel’s Personalization applet is still available, but is completely hidden in Windows 10. Use the following trick to access the color mixer through the Color and Appearance options in Windows 10. The command brings you directly to Color and Appearance option in Control Panel of Windows 10, allowing you to “show color mixer” to pick any color you want for your window borders and window title bars, and if enabled, Start, Taskbar and Action Center.